The last post discussed why one should give the ‘nod’ to wooden furniture: simply because it has way too many benefits to look past. This post will discuss how you can play up your wooden furniture and wall colours to add that extra element of style and class to your space. Irrespective of the type of wooden furniture you have in your space, be it oak or mahogany, it will only be unfair to not enhance its appearance and its quality finish. Here are a couple of ways that will tell you how you can work up an outstanding space for yourself by experimenting with different wall tones hues that will accentuate your wooden furniture. If your wooden furniture has a war underlying quality, these two bright and happy colours can do wonders to your space by highlighting the slight orange and yellow tints of your wooden furniture, when used correctly and in the right amounts. This in turn will complement your space not only in terms of appearance but also in terms of the overall warmth and feel that it will eventually give. The lightness or darkness of a color is meant to be its value. So, if your wooden furniture has a cool undertone (shades of gray), by using a warm color (yellow or even a pale orange), you can sustain the vibrancy of the warm-and-cool mix. When you think blue, you think of something that’s rather calm and cool. For instance: the ocean, the sky or a slow song. However, if you use this colour well in your space, it could complement your wooden furniture in a rather bold and intense manner by highlighting its orange. If you’re willing to experiment with an intense, bright blue, the contrast can be quite mesmerizing and edgy depending on the underlying quality of your wooden furniture. 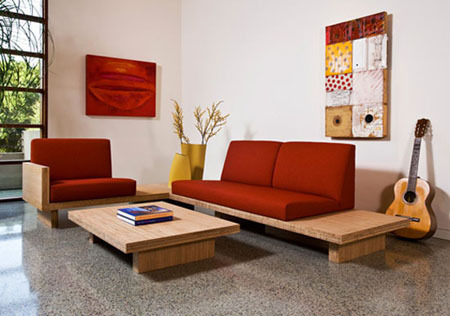 Note that if not used correctly, the entire feel of your space may come across as a tad bit too harsh. Wooden furnishings usually get tarnished over time and acquire hints of orange and yellow that adds to the depth and twists. If you are keen on experimenting and like the look of dark furniture against light walls (or light furniture against dark walls), you can opt for something like a mahogany or a cherry to strike a sharp contrast against any light color, be it a tinge of blue, green or maybe even a more vibrant colour from the colour-wheel. Exactly the same way, light wood would reflect pretty strongly against a bold, deep colour. If you want contrast with medium-tones, use wall colours that are subtle and light. From white, gray and beige to black and brown, neutral colours are the safest to go with in terms of decorating your space and accentuating your wooden furniture. If you want to go for a colour that lies in the same color palette as your wooden furniture, keep in mind that color of your wall must necessarily be at least two shades lighter or darker than the furniture. This is important because you don’t want them to match. The darkest neutrals of these colours will complement the warm undertones of your wooden furniture as much as they will the cool undertones. This entry was posted in Uncategorized and tagged decorating with wooden furnture, how to build a room around wooden furniture, interior decorating with wooden furniture, living room with wooden furniture, What color wall paint to goes with wooden furniture, Wooden furniture and wall tones. Bookmark the permalink.